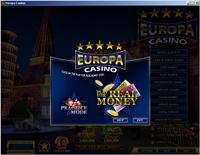 On this page you will learn how to start playing with Europa Casino! 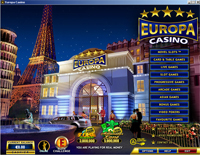 First you need to download the casino installationprogram. Click here, and then click on OPEN. Choose a language. The program will ask for your permission to download the files that are necessary for the installation. Click on OK.
After the download is finished, click "Install". You will get a user's agreement which you will need to accept, click on "I agree". The program will be installed and then it will start automatically. Choose "Play for real money" and then click on "Create account". Fill in the requested information, these will be held strictly confidential and won't be sold on. After you have filled in the information, you will receive a username, We recommend you to write this down! You can now deposit money to place bets and play. 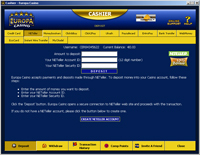 In the lobby, click on "Cash register" at the bottom lefthand side. Choose a method and follow the instructions. You can use the credit immediately! We wish you a lot of fun and winnings!